This Club takes Cultural Club like a way bridge between CCRT and school to carry out various activities to reach the ultimate aim of education. 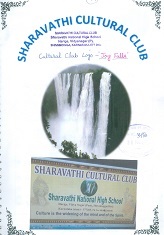 Sharavathi Cultural Club is working like immense, continuous flow of its logo – jog falls pledge of the Club Says that as citizens, member shall upload the values, virtues and glory of our rich Cultural Heritage. 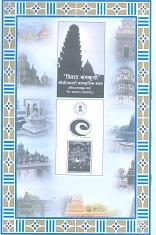 This Cultural Club progressed with exhibition of CCRT educational material, study of India’s historical places & monuments, essay competition on Importance of Value education in schools, learning songs in National Languages, making of colorful lanterns, yoga demonstration by the students, meditation, traditional Rangoli, food making , speech quiz , competition, lecture on control of air pollution and ear rifts making classes. शिक्षक प्रभारी - सुश्री नसीमा पी.यू. Activities start by taking the pledge and singing of Club song warm welcome is given to the new comers and small gift also awaits for each new child. See how Visit to kadalundi mangroves, on world environment Day made the students understand about the ecosystem of various plants and birds. Five seedlings are distributed to all the Club members and they pledge to grow these plants with great care, named as Swabhiman Plants. Club celebrated Anti-Narcotics Day, Independence Day, karshaka dinam ie farmer’s day in which the members grow herbal plants in their houses. Students visited pazhassi Raja museum and Art Gallery started at east hills, Kozhikode. Training on preparation of phenol solution was given to 10 mothers, of which some are continuing making and selling. Visit to Regional science Centre was able to get the school a Telescope and make arrangement for a sky watching camp. Various workshops on making of L.E.D. bulbs, pottery, writing chalks, and visits to Kerala craft village, nature study comp, botanical garden and Beaches were also organized. Most Important was when the Club member specially decided to give potted plant to school on each ones Birthday. ‘Uttaran’ started its journey through celebration of 25th Baisakhi (May) birthday of Kobiguru Rabindranath Tagore through Rabindra Sangeet, skills and dances. Message of Tagore conveyed says ‘let me not pray to be sheltered from dangers, but to be feeless in facing them let me not be for the stilling of my pain, but for the heart to conquer it’. To make students take interest in handicrafts paper Bag making, ornament making by jute, cane, seeds & beads, paper works and dying Art forms of West Bengal, workshops were organized. Camp on yoga and meditation was organized by sahaj yoga meditation centre, tree plantation day was celebrated by planting trees, Independence Day was celebrated through flag hosting, patriotic songs, lathi khela and yoga. To make member understand about craft works of west Bengal village’s educational tour Biswa Bangla Hut, Kolkata was arranged. Special workshop on making of kaleidoscope was also organized to gain knowledge and for entertainment. Various performing arts like kavigan, bratachari, Ranpa dance, Dhali dance, adibasi dance, bohurupi, leto gan, baul were presented. To express love, gratitude and adulation to honor Grandparents ‘Grandparents day festival’ was organized, in which Grandfather shared his experience of school and Grandmother told her child hood story. 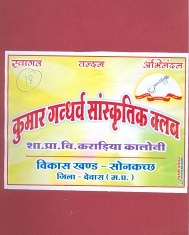 शिक्षक प्रभारी : श्री जाडकर आर. डी.